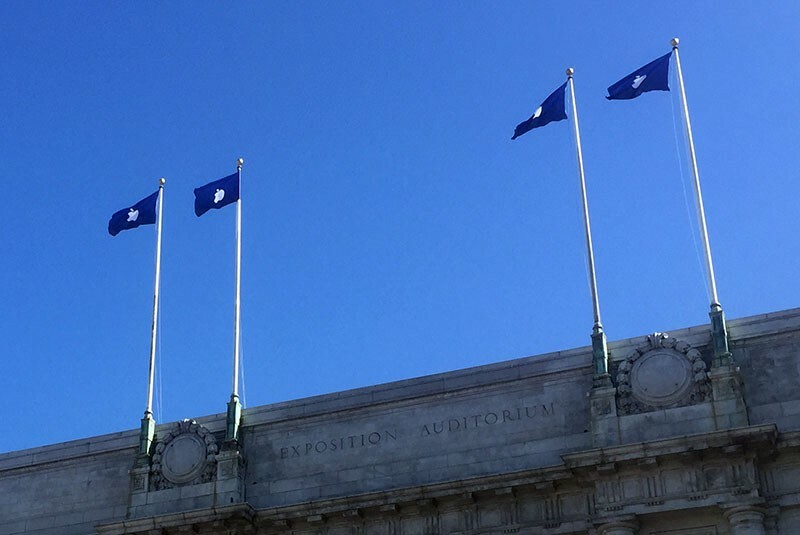 Ahead of next week's big iPhone-centric event, Apple has begun decorating the Bill Graham Civic Auditorium in San Francisco where the event will take place. As shared by several Twitter and Instagram users, signs with the Apple logo are beginning to go up, and several Apple-branded flags are flying. A white Apple logo with rainbow-colored accents against a blue background is shown on one wall of the auditorium, shared by CBS/CNET photographer James Martin. The same design was seen on the invitations for the event and was created to mimic Siri's look on the Apple Watch and iOS 9. Security is heavy around the auditorium, with security guards and police officers guarding signage that's being put up, according to someone on site who spoke to MacRumors and provided pictures. Some of the security guards are now wearing outfits with Apple logos on them. The colorful Apple logos are accompanied several flags surrounding the auditorium, featuring a white Apple logo on a dark blue background. Swarms of workers are all over the perimeter of the auditorium, running cables up walls into the interior and building out the infrastructure needed for the event. Along with the flags, Apple has decorated light posts in the area with matching Siri-style banners in a dark blue shade. 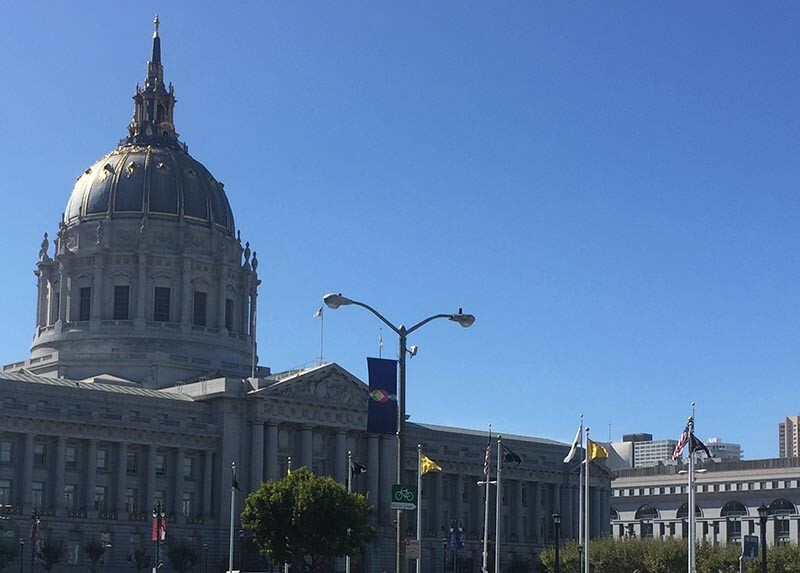 The decorations for the Bill Graham Civic Auditorium are already beginning to outshine decorations and signage used at past events, and Apple is likely to continue adding more over the course of the weekend. Apple's upcoming Wednesday, September 9 event is expected to be huge. The auditorium where it's being held seats 7,000, and the company may be using some of the available space to demo products that will be released. The event will see the debut of an unprecedented number of devices, including the iPhone 6s and 6s Plus, the new Apple TV, the iPad mini 4, and the iPad Pro. Apple is also expected to introduce additional Apple Watch Sport materials, perhaps in gold, and new Sport bands. An iPad keyboard may also make an appearance at the event, and we'll also get release details for iOS 9 and watchOS 2. MacRumors will provide live coverage of Apple's event, through a live blog on MacRumors.com and on our MacRumorsLive Twitter account. In what universe is the background of this BLUE? I was walking past there today and I saw the Apple hired goons roughing up a homeless person. PS: Yes it did happen, if I had my phone I would have taken a video to counter the inevitable deniers. I was walking past there today and I saw a unicorn eating a bowl of cereal. I think this is too big for just a normal announcement. Even if they are announcing new iPhone, TV, laptops and iPad, I have a feeling something else that nobody is expecting will come up. With all the decorations, and a myriad of rumors flying around, seemingly more than normal, I think Apple is covering up something big. Classic misdirection. We shall see. I hope for the sake of those emotionally connected to Apple that there's something of significance to see. They buy into the hype hook line and sinker. The tension filled, anticipatory posts that reveal how much a single Apple event means to them is unlike anything seen anywhere else. These are highly invested worshippers. And you're here because... you're not so emo? I was walking past there today and I saw the Apple hired goons roughing up a homeless person. The funniest thing was when a cop arrived and he basically ignored the homeless guy (who was most likely mentally ill) and just seemed to be telling off the hired goons (going by the finger jabbing). Yes. A MacRumors member since 2010 doesn't have his iPhone on him. Yup.